The Grand InterContinental Seoul's Japanese restaurant, Hakone, has an elegant and delicious solution to the problem of what to eat during working or picnics. Beginning this month how about considering one of their classy lunchboxes for your meeting? Further, your concerns about using disposable containers for this meal can be assailed by the fact that all the containers are specially designed to be environmentally friendly. Hakone is featuring two different types of lunchbox: the Bento Lunchbox set and the Sushi Lunchbox set. The Bento Lunchbox set features seasoned pollack roe in delicious sesame oil, sirloin teraki, pickles, salad, fruit and crispy fried shrimp. In addition, enjoy two types of seasonal fried fish such as salmon and codfish as well as eel, egg roll, rice and plum. 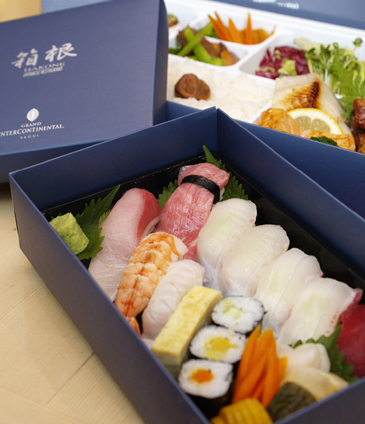 The Sushi Lunchbox set is highlighted by a selection of nine different types of sushi including tuna, flounder, sea bream, salmon, and squid as well as vegetables, egg roll and Japanese-style pickles. The Bento Lunchbox set goes for 40,000 won and the Sushi Lunchbox set for 45,000 won. 10 percent of VAT (value added tax) will be added. Please give one day's advance notice for orders of ten or more lunchboxes. Our lunch boxes are available for dinner too.